Labour groups and unions gathered in Winnipeg on Monday to mark Labour Day. Workers, unions and community leaders met at Memorial Park before marching to Vimy Ridge Park for a community barbecue. 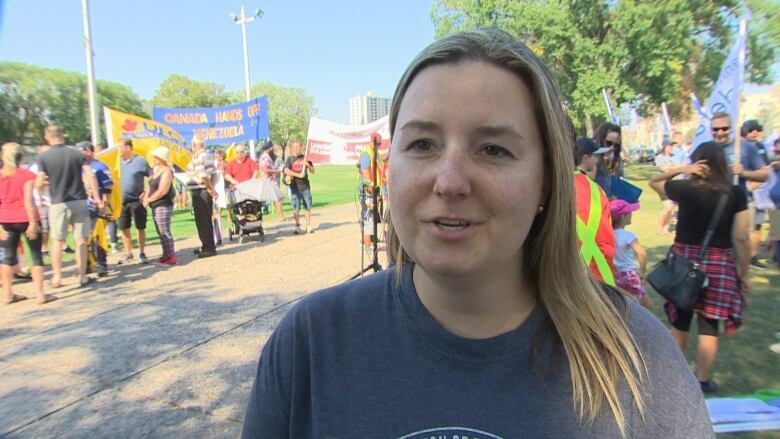 "We're celebrating the gains that unions have made in Winnipeg and across Canada," said Basia Sokal, president of the Winnipeg Labour Council. She added the day is especially important right now, as workplaces change across the country. "In a time when we have economies such as Uber or Skip the Dishes telling you that can be your own boss, we need to band together and recognize that's not a message we should be OK with," she said. "Unions and workers have fought for hundreds of years for rights such as benefits, wages and overtime pay that these companies and gig economies want to take away from us." Winnipeg's Labour Day event organizers also joined others across the country in calling for universal, single-payer prescription drug coverage for everyone in Canada. "Many unionized workers have prescription drug coverage through their collective agreements," said Sokal, in a news release sent to media before the march. "This isn't just about union members. This is about doing the right thing for everyone in Canada." 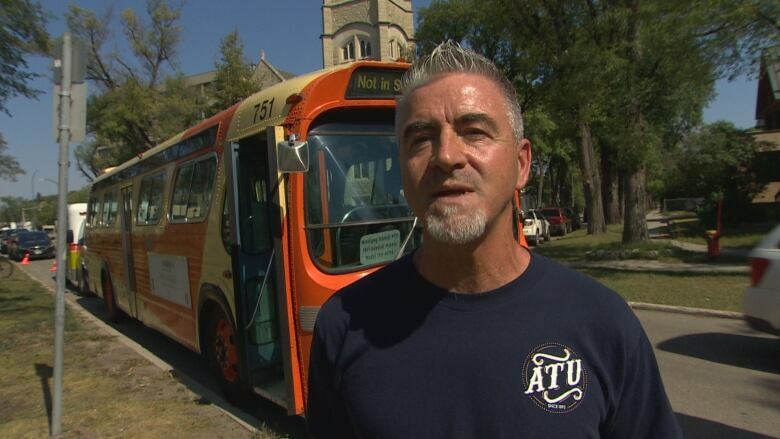 John Callahan, international vice-president with the Amalgamated Transit Union, attended the march, and said the day gives his union an opportunity to amplify its call for a national inter-city bus service. The push comes on the heels of Greyhound Canada's decision to stop nearly all of its passenger and freight service in Western Canada. "ATU Canada has been talking with the federal government … about what can be done to either support and fund the Greyhound service in the interim until we come up with a strategy to fill the vacancy created by the loss of Greyhound," he said, calling the service vital for many Canadians, especially those living in the north. "It's a lifeline for them into the city for doctor's appointments." 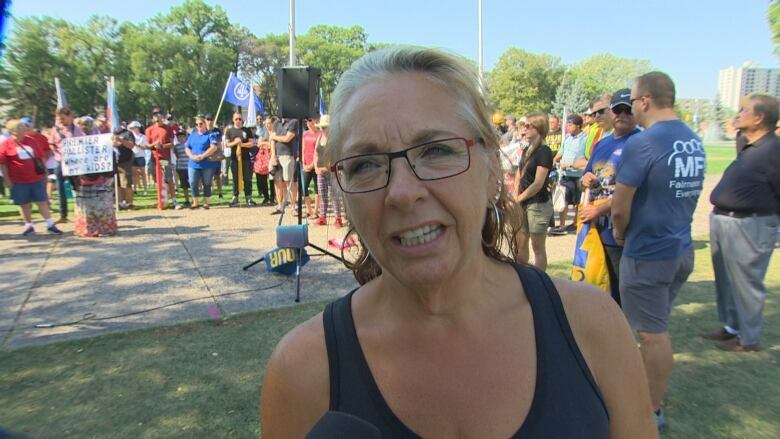 Manitoba Government and General Employees' Union president, Michelle Gawronsky, said the Winnipeg march was just one of many events held in communities across Manitoba on Monday. "We're here to honour labour and honour the work that has been done in the past and the work that is being done today," she said. "In Winnipeg here, the Winnipeg Labour Council has invited all of us to come in to be able to celebrate labour, and to honour those who worked before us that gave so much so that we can enjoy what we have today." 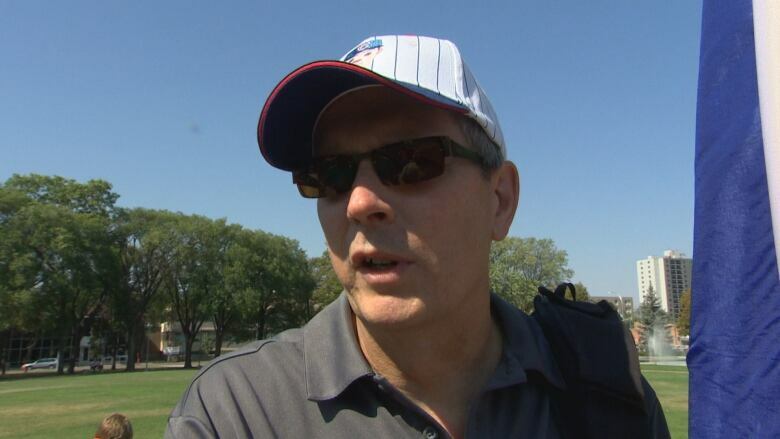 James Bedford, vice-president of the Manitoba Teachers' Society, said his union's members attended the march "because as educators, the future of this country is absolutely essentially important." But he said he also had personal reasons for coming to the march as well. "I'm here for my own daughters because I want a better Canada than the Canada that I grew up in," he said. "The labour movement is all about improving working conditions, which means better safety and fairer remuneration for everybody, not just for unionized employees." 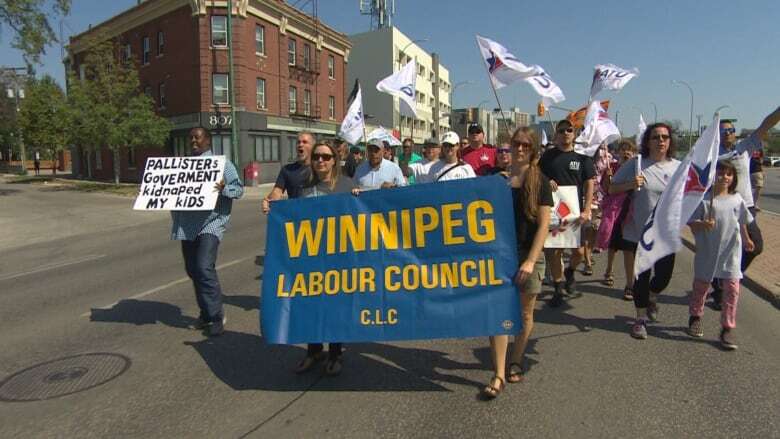 Labour groups in Winnipeg are gearing up for next year's 100th anniversary of the Winnipeg General Strike, and Sokal said the Winnipeg Labour Council has a number of events planned to mark the anniversary across the city next May and June.